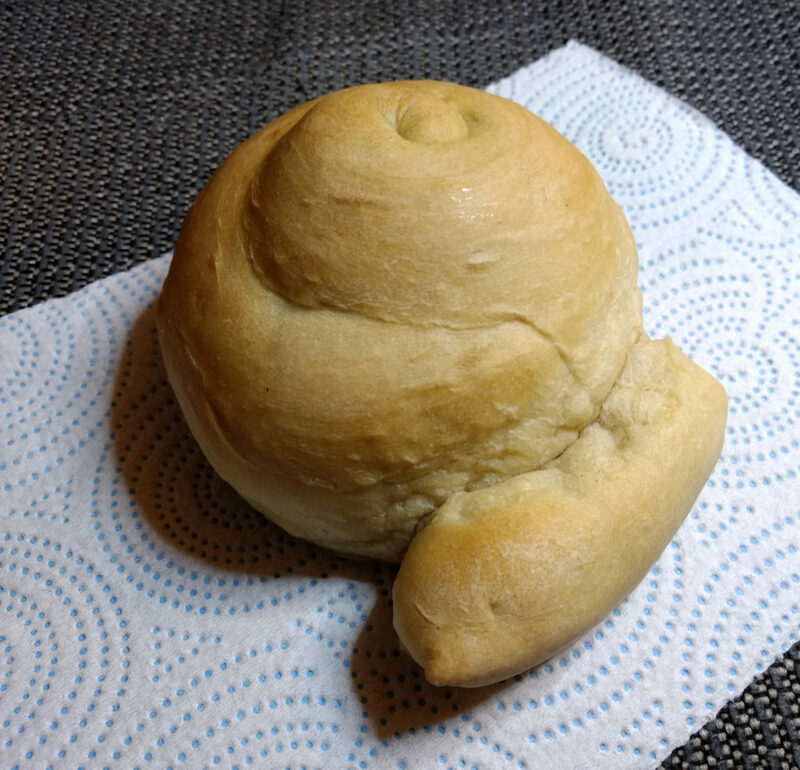 One of Jackie’s coworkers at the bakery had less than a loaf’s worth of dough, so she made this sourdough snail. Jackie and I bake all our own bread. I can’t remember the last time we bought a loaf of ordinary bread, although we buy other kinds of bread products from time to time (croissants, english muffins, etc.). We take turns baking, and are pretty jealous of our turns. Except for when Jackie broke her wrist and I got to bake all the bread for 7 or 8 weeks, I don’t think I’ve baked two loaves in a row more than a couple of times, and I think Jackie got two turns in a row only once. We’ve had a sourdough starter going for at least fifteen years now. (We call her Bubbles.) I wrote about how we bake sourdough bread in a Wise Bread post a few years ago. Every loaf is different, of course. Some have butter or olive oil, others don’t. Some have sugar or honey or molasses, others don’t. Some have salt or baking soda, but usually neither. Some include large or small amounts of rye or barley or oats or other more exotic flours, others don’t. Still, most of my loaves are pretty similar—a cup of bread flour, up to a cup of non-wheat flours, and then the rest whole wheat flour. But it occurred to me a couple of days ago that in fifteen years of baking—probably 400 loaves over that time—I’d never baked a loaf of white bread. 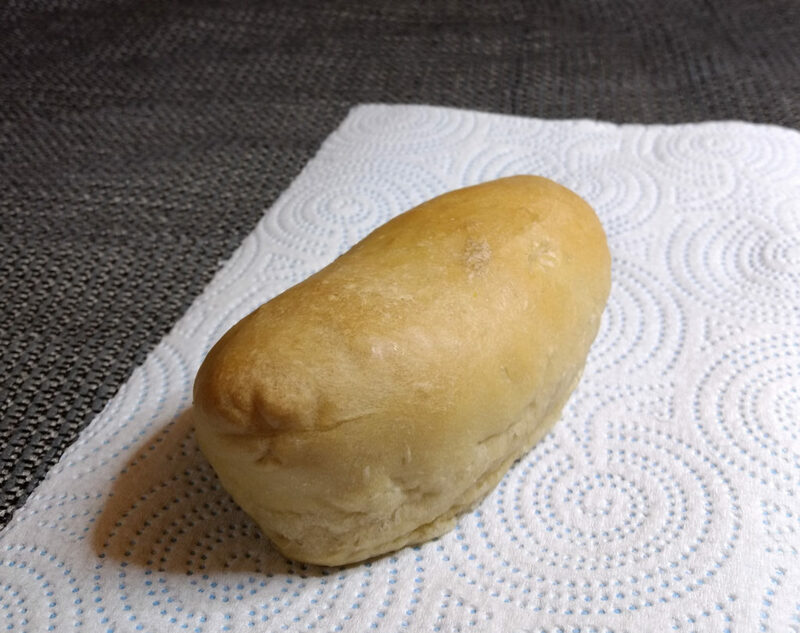 So, a couple of days ago, I decided to bake a loaf of white bread. I read a few recipes for French country sourdough before I started, just to see what they all had in common, which is how this loaf ended up with a little salt and a tablespoon of white sugar. Except for two tablespoons of flax-seed meal, the flour content was entirely bread flour. What a great loaf of bread! Not so much with the fiber, I guess, but tasty. We immediately thought of all sorts of things that are especially good with white bread—garlic bread (which we had last night with spaghetti) and french toast (which we had that morning with grade B maple syrup). This loaf went so quickly, I got special dispensation to do a second just the same (or else I wouldn’t get a grilled turkey and cheese with mustard sandwich or a peanut butter and jelly sandwich). We won’t be switching to white bread of course. There’s a reason we’ve made whole-grain loaves for fifteen years. But I’ll remember this loaf. Once or twice a year seems like a much more reasonable frequency for white bread than once or twice every fifteen years. Back in 1992, Jackie and I took a trip to England and Wales. We spent a week in London, a week in St. David’s (hiking on the Pembrokeshire Coast Path), and then a couple more days back in London visiting an old friend who took us out to dinner, to a play, and then to Bath to see the Roman ruins and other such stuff. In Bath we had afternoon tea in the Pump Room with scones and clotted cream. Upon returning, I kept my eye out for clotted cream, figuring that I could make my own scones, but I never saw any. They turned out great. As good as any scones I’ve ever had. I write science fiction and fantasy stories. I speak Esperanto, and use it to communicate internationally. Esperantistoj, legu mian esperantan hejmpaĝon. To my very great surprise, I seem to have become a taiji instructor. I teach both beginners and continuing students at the Savoy Recreation Center. For eleven years I was a senior writer at Wise Bread, writing about personal finance and frugality. Little shelf fungi. The ones on the next log over were all green (like the lower ones on this log), but the light was better here. Some lichen or algae growing on the fungus maybe? Jackie hiking up the trail. Me with Jackie's staff in one hand and an ironwood tree in the other. Jackie heading down some steps along the trail. Jackie going up the steps, back at the trailhead.